In the background of just about every night scene in every movie or TV show you’ve ever seen is The Slash. 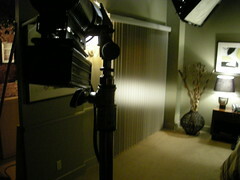 It’s the thin diagonal line of light that highlights curtains, walls, blinds, trees, shrubbery and slow-moving extras. The Slash is one of those things that has no base in reality at all, but looks really nice and brightens up the background in an interesting way so everybody does it. Should you be very bored and have on hand a bottle of some sort of alcohol, I recommend putting on a movie with a lot of night interiors and taking a shot each time The Slash makes an appearance. On second thought, maybe not. You might not make it to the end of the movie. I’ve found that “slow-moving extras” is usually redundant, except when the P.A. who was assigned to keep an eye on the craft service table is 10-100, or the moment that 2nd Pizza arrives. Of course, your milage may vary.